The Final Four is upon us and it’s time to settle in with an adult beverage as we cheer on our team to victory. If you’re looking for a drink to help you support your team in an authentic fashion, then give one of these regional cocktails a try. This the Auburn’s first ever trip to the Final Four and the Auburn Family is ecstatic to say the least. Following the Tigers’ win over SEC basketball blue blood Kentucky, Auburn fans rolled Toomer’s Corner, a favorite tradition following home football wins on the Plains, apparently using some much toilet paper in the process they caused a state-wide bathroom tissue shortage. With that in mind, the drink of choice to imbibe while watching Auburn’s run through the Final Four is a boozy version of the famous Toomer’s Drug Store Lemonade. 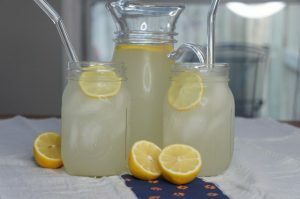 This recipe, courtesy of the good folks at Southern Source, uses 12-14 lemons, a generous amount of sugar, and an even more generous amount of vodka. In a small saucepan, heat sugar and water together. Stirring until sugar is completely dissolved. Let cool. What better drink to sip during Virginia University’s Final Four Run than a classic Whiskey Sour. Virginia is known as the birthplace of American whiskey and the whiskey sour has deep roots in and around Charlottesville. 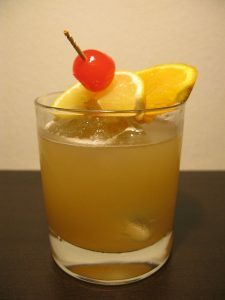 In fact, the whiskey sour Jefferson Literary and Debating School founded at the University of Virginia way back in 1825. What does this have to do with basketball? Not a damn thing, but this classic cocktail seems an appropriate choice to enjoy for the Cavalier’s first trip to the Final Four since 1984. This simple whiskey sour recipe comes courtesy of the Virginia Alcohol Beverage Control Authority (VABACA). Garnish with a cherry and a half-slice of lemon. Golden Cadillac: Sometime in the early 50s, a couple came in to Poor Red's BBQ and asked the bartender to mix up a new cocktail to celebrate their recent engagement. The bartender noticed that the couple had arrived in a brand new golden Cadillac and decided to make a drink to match it. This is the recipe he came up with. The Golden Cadillac became so popular that Galliano eventually gifted Poor Red's with their very own Golden Cadillac to display outside the restaurant. Pretty hip, huh? . 2 Ounces White creme de cacao 1 Ounce Galliano 1 Ounce half-and-half. . Combine with 1/2 cup crushed ice in blender on low speed for 10 seconds. Pour into chilled champagne flute. Serve in a Champagne Flute. Of the teams remaining in the 2019 NCAA Basketball Tournament, only Michigan State can be considered a traditional basketball power, appearing in ten Final Fours and winning two championships in its proud history. You could say Michigan State is the cream of this year’s crop, so a rich, creamy cocktail seems more than appropriate. Enter the Golden Cadillac, an after-dinner digestif featuring Galliano, white crème de cacao, and cream. While the drink was invented in the early 1950s in a California bar called Poor Red’s, the Golden Cadillac become a favorite of drinkers in Michigan during the state’s auto manufacturing boom in the mid-to-late 20th Century. This version of the Golden Cadillac comes courtesy of DrinkMixer.com. Also making their first appearance in the Final Four are the Texas Tech Red Raiders. Located in Lubbock, this West Texas town is well-known for its signature drink, the Chilton. According to Texas Monthly magazine, the Chilton. Practically unheard of outside of Lubbock, but if you’re pulling for the Texas Tech to bring home a championship, this simple and refreshing cocktail is just the right drink regardless of where you may be watching the Red Raiders. The Chilon is also very simple to make utilizing just Vodka, lemons, and soda water.